The Burnets are very distinctive colourful day-flying moths with clubbed antennae that fly in a direct, rather bee-like manner quite different to other moths. 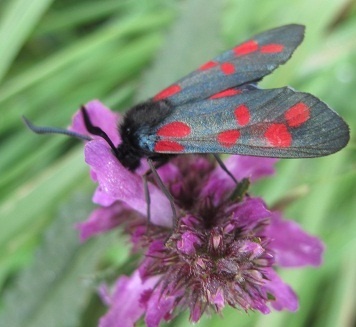 The Six-spot Burnet is one of the commonest species, often seen nectaring on grassland flowers. The well separated six spots on the forewings identify it from the two otherwise very similar five-spotted species. The pupal cases are conspicuous on grasses and even metal fencing. Common and Greater Birdsfoot Trefoil. Resident, common and widely distributed.